The results of replacing centrifugal fans with plug fans at Harrow Leisure Centre are being monitored with a view to its replication at other sites of Everyone Active. For the last 30 years, centrifugal fans have been a central component of air-handling units (AHUs). However, with the pressures of the ErP Directive and energy efficiency under increasing scrutiny, building owners are now upgrading these units to plug in fans for greater efficiency and longer AHU life — as Chris Jones of Fläkt Woods, explains. Often found in AHUs, centrifugal fans have stood the test of time in many ways. However, as HVAC has evolved in-line with energy-efficiency standards, they are no longer the most suitable option available. In terms of an AHU, the aspect which has the highest electricity consumption is the fan, and by replacing an outmoded centrifugal fan with more up-to-date technology, building managers can make serious savings. The issue with centrifugal fans is that energy loss is inherent in their operation. Traditionally driven by a motor in a belt and pulley arrangement, improving the efficiency of these units is extremely difficult. In fact, according to CIBSE, the inefficiencies of a centrifugal fan can be anything from 2 to 10% and more — far from minor losses. Whilst there are models available which can be operated as direct-drive fans to eliminate belt losses, these are restrictive and have limited applications. The only other gain has been from moving from a forward curved to a backward curved design to improve aerodynamic efficiency. Given that there has been little progress made in raising the efficiency of these units, it is no surprise that an alternative solution has emerged to cater for rising HVAC standards. 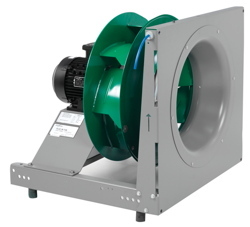 The plug fan is a purpose-designed, free-spinning backward-curved centriflow impeller which can be used within the casing of an AHU, providing an effective, energy-saving replacement for centrifugal fans. A typical upgrade from a double-inlet centrifugal fan to an inverter-driven direct-drive plug fan will lead to energy savings in the region of 30% annum and payback periods of less than three years at average UK electricity prices and annual running hours for an air-handling unit. In fact, a government organisation based in Surrey that upgraded the belt driven centrifugal fans in its building’s AHUs (originally installed in the 1970s) to plug fans connected via a variable-speed inverter drive, saved £45 493 in the first year alone. By monitoring performance both before and after the upgrades, it was calculated that the first phase of the upgrade works will pay back within less than three years, and the second phase in less than two. Replacing centrifugal fans in air-handling units with plug fans such as illustrated here will lead to energy savings of 30% a year. 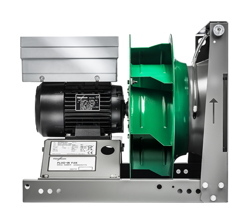 Plug fans are available in either inverter-driven direct drive or EC versions. EC plug fans are suitable for smaller AHUs and lower air flows, and energy savings can be achieved even with short operating hours. In addition, their reduced profile means they can be fitted into tighter spaces. Modern plug-fan technology can be used to significantly increase the duty (both the volume and pressure) of the air being supplied through HVAC equipment, potentially alleviating the need to install additional AHUs to serve an increased load. Many building operators and owners that have extended the life of their AHUs by replacing old centrifugal fans with modern plug fans are using data logging to predict and validate energy savings. For example, when Harrow Leisure Centre, part of the Everyone Active Group, reviewed its energy consumption, it identified there was potential to become more energy efficient by upgrading its AHUs. The existing system, which included several Fläkt Woods’ AHUs, had been operating for over 30 years. On surveying the plant room with partners Heasalls Mechanical and the leisure centre group’s M&E contractor, Fläkt Woods found that a plug-fan retrofit would offer cost and energy savings for the site. Following a successful trial in the centre's ‘changing village’ area, all the existing fans were also upgraded with new Fläkt Woods models, in tandem with the existing ABB ACH550 inverter drives. Through upgrading the previous centrifugal fans to new ErP compliant plug fans, the facility now benefits from reduced energy consumption, electricity load and CO2 emissions. Everyone Active is continuing to monitor the energy consumption at Harrow Leisure Centre and analysing the performance data for this initial project, with the aim to replicate this solution across other sites. In addition to delivering energy savings, plug fans offer lower noise levels, and are easy to fit and maintain. For many building owners, a quick and simple retrofitting process is crucial in order to minimise downtime for occupiers. When it comes to commercial buildings, energy is not only a hot topic now, but will continue to be so for years to come. With this in mind, upgrading to ErP compliant plug fans can be a simple way of improving the efficiency of an entire building. Integrating plug fans into existing commercial ventilation systems can reduce energy consumption, along with electricity load and CO2 emissions. Given the ease with which plug fans can be installed, making the move from centrifugal fans to plug fans is a no-brainer for building managers looking to modernise HVAC systems. Chris Jones is product manager with Fläkt Woods. How valuable is all that data from a BMS?